Dynamic ads, 3D audio, geographical targeting on mobile and social storytelling all form part of the future of Global's digital business, the company said today. At today’s IAB Digital Upfronts, the owner of Capital, Heart and Classic FM radio stations used the opportunity to promote Dax, its Digital Audio Exchange platform to an audience of creative and media agencies. Dax highlighted its capabilities using its new Listener Insight ID, which enables it to track user behaviour from their audiences using mobile. 3D audio, which is an immersive surround sound experience delivered through headphones, is a new format on mobile that the company has begun using, following its own insight that found a 60% lift in people’s emotions while listening to audio through headphones. Dynamic ads and geographical targeting were also hailed as new ways for brands to target consumers, adapting audio ads in real time through mobile based on users’ behaviour or combined with out-of-home campaigns, serving ads with users literally on the move. Global also showcased its new "social storytelling" shift to focus on engagement instead of reach, creating live branded content through video, games and articles using its in-house celebrity talent, distributed across all its social channels, and allowing its audience to participate in real time. 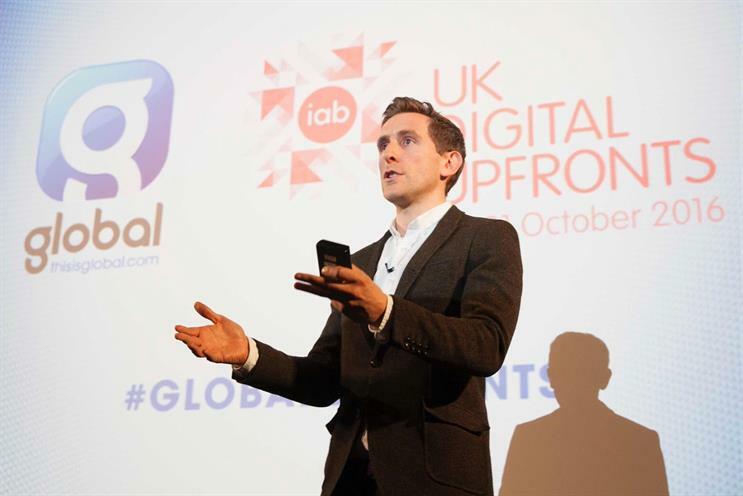 Global’s commercial digital director Ollie Deane told Campaign that all of the developments announced today would help give audio, as an ad medium, the same kind of capabilities that were already common in digital display and video. Listener ID, the tracking tool launched by Global’s Dax platform, will allow for "post-listener tracking", meaning advertisers will be able to see information about the digital behaviour of listeners after they are served the ad – bringing audio in line with other digital formats. "Since you were able to serve digital audio ads, post-listener tracking has been a challenge," he said – due to the difficulty of inserting tags into an audio file. While workarounds had existed, Deane said that this was the first time anyone had attempted to use tags at this scale in digital audio advertising. Personalised audio ads, meanwhile, will be able to use the listener’s data to insert specific elements into an audio ad – for example, in an ad for a retailer, it would mention the particular product most likely to interest the individual. Deane said that Global had begun testing this technology and was expecting a rapid uptake. The concept of 3D audio ads does not use new technology, but came about because "VR is big on people’s agenda", said Deane. "It’s quite immersive, but why it’s really big now is that it can be played through any set of headphones – as long as you do that, you get quite a powerful effect." Location-based ad serving, meanwhile, will allow ads to only be served to listeners in specific geographical areas. This could include those within a certain distance of a store, but it could also be used to tie audio ads in with an outdoor campaign, through activating the ads when the user is close to a poster or billboard. Director of commercial strategy Stuart Mays said that the new approach to social being introduced by Global reflected that fact that social had "become a reach platform", a state of events that he said did not play to its strengths. "We think there’s a crazy opportunity that social presents – rather than relying on reach, it has to be about engagement," he said. "All too often, so many companies just stick a logo or a tag on the end of clickbait videos." Making worthwhile social content meant understanding exactly what your audience did and didn’t like, and facilitating as close a collaboration as possible between the partners involved, he added. "The other part of it is rather than just create and distribute, you also learn and evolve – you update and change the content if it’s not resonating." Does the upfronts season matter for UK media industry?